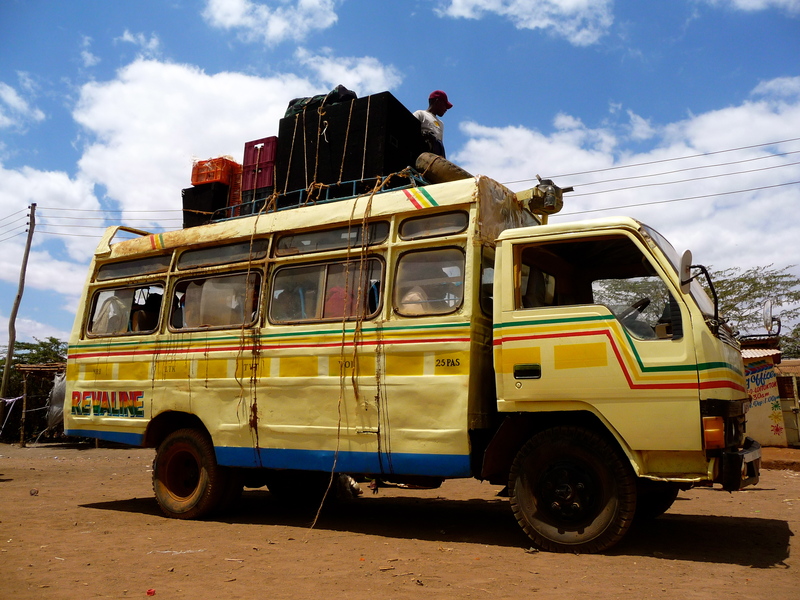 The roof of the bus was loaded to the heavens with baskets, chickens, sacks of rice, people and two Kathmandu packs. Inside were dozens of old men, women, children, babies, more chickens and two dusty Kiwis. I have never experienced such incredible hospitality, such generosity, such kindness of spirit, such a desire to teach or such a passion to preserve a unique and beautiful culture as my time with the Maasai. Tumaina, our host, went out of his way to ensure we felt at home – despite being so far away from home in every possible sense. We were warmly welcomed by the entire community of Rombo, a Maasai settlement on the Kenya/Tanzanian border in the shadow of Mt Kilimanjaro and from the moment we arrived, Tumaina made sure we were well looked after. 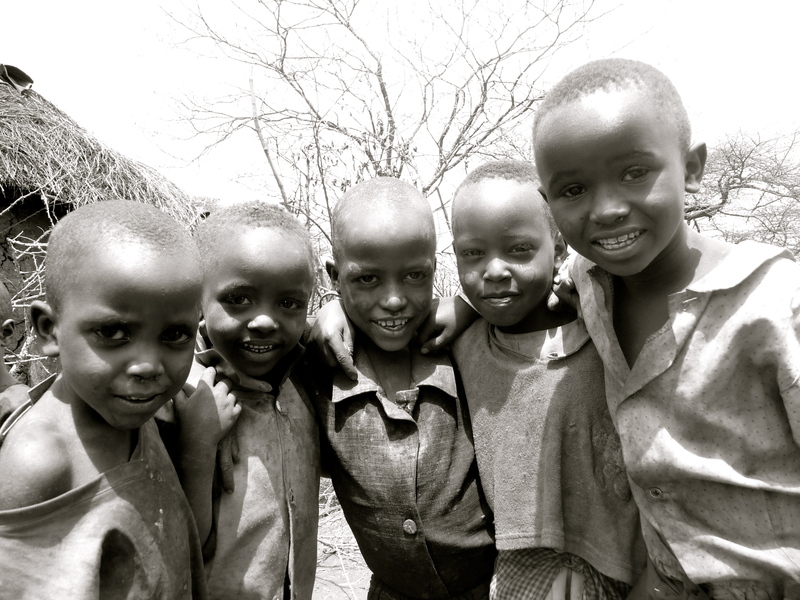 There was hot water waiting for us to bathe (in a bucket but it still felt like luxury), rice and beans to eat, sweet Maasai tea to drink, and waiting under our pillows were beautiful beaded necklaces that his mother had made for our arrival. We were blown away. Tumaina was determined to teach us the ways of the Maasai and the first morning was a hilarious occasion – he left the two city girls in the bush to start a fire and keep it going to cook our omelettes (Maasai style) and heat milky tea for breakfast. Inevitably we used all the wrong wood and leaves and the fire went out but he patiently showed us which ones worked best, which ones they used in the bush and soon the fire was roaring. We cooked up a feast – there was no way we were ever going to go hungry here, despite there being the worst drought in living memory with carcasses of cows littering the bush, we were to eat like queens. A friend of Tumaina’s arrived to take us to visit his house. When I asked him where he lived, he replied ‘On the border with Tanzania.’ That sounded like an adventure. And far away. And of course we were to use the only transport possible – our legs. Two hours in the scorching sun through land drier than I have ever seen in my life, past withered cows and people (Mayeni, our host for the day, told us that 70% of the Maasai cows had been lost this season and the elderly are also dying – not from hunger or thirst but from broken hearts – here cows are valued as highly as people) until we finally reached a dusty crossroads with nothing but a donkey to mark the spot. This was the border with Tanzania.The Maasai do not recognise the difference between Kenya and Tanzania – this is Maasailand and they live within it. The government and others can make arbitrary borders but this is their land and there is no distinction made between the Maasai from either side – they are one people, united, strong and proud. 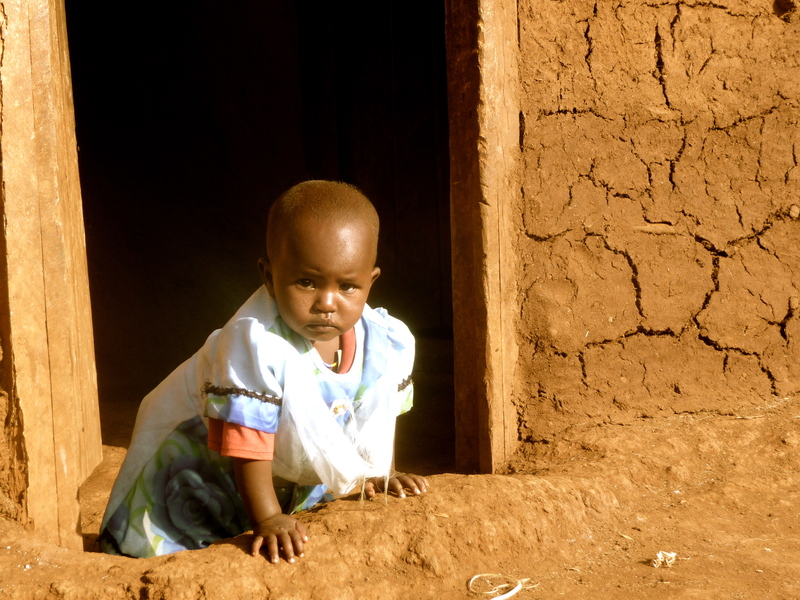 We walked along the border until a grouping of mud and thatch huts appeared – Mayeni’s compound. We passed his grandfather who was sitting on a small stool outside one of the huts. He was wrinkled to the point of a prune and for good reason – he was 110 years old. And he was sitting in the sun sipping a cup of local brew. I liked him immediately. Inside the compound we met Mayeni’s mother, dressed in her full Maasai finery complete with dangling ear lobes and more jewellery than a bead factory, adorning giant beaded necklaces and bracelets. Her head was shaved as is traditional for women and her smile revealed the signature missing bottom teeth of the Maasai. She had the unlikely name of Grace, but I think this was more for our benefit – most people have both Maasai names and Christian names. We sat and chatted to Mayeni and his sister Ann, eating pancakes and drinking more sweet, milky tea. We asked to take a photo of their whole family and were more than a little surprised when they all arrived – 10 children in total! Warm smiles and nodding heads overcame the language barrier and we were made to feel right at home, here in the middle of nowhere with Mt Kilimanjaro keeping watch overhead. We thanked them profusely for their hospitality and began the long, hot walk home. The following day Tumaina took us to the small Maasai museum he had set up, the only one of its kind. He is the chairman for a Community Based Organisation called Pillars for Maasai Development, aimed at preserving their rich culture but also encouraging education amongst the largely illiterate population. On the way to the museum we bumped into some wandering Maasai. They were on their way back from bathing in the river (not quite sure where that was – the only ‘rivers’ I saw were dried up), brushing their teeth with sticks as we also learned to do and were intrigued by these strange muzungus. They decided to join us. It was a lesson in love. It was time to hit the bush on another lengthy journey. To us it was a gruelling trip but here it is just a way of life – not only does no one have a car but there are no roads in the bush. There are thorns and rocks to guide you and attack you along the way instead. We visited another compound where Tumaina’s friend Likampo lived with his two wives and 7 children. More sweet tea and more conversations with the help of Tumaina’s translations and much smiling and nodding. The men of the compound helped to walk us home and were in a real hurry at first. 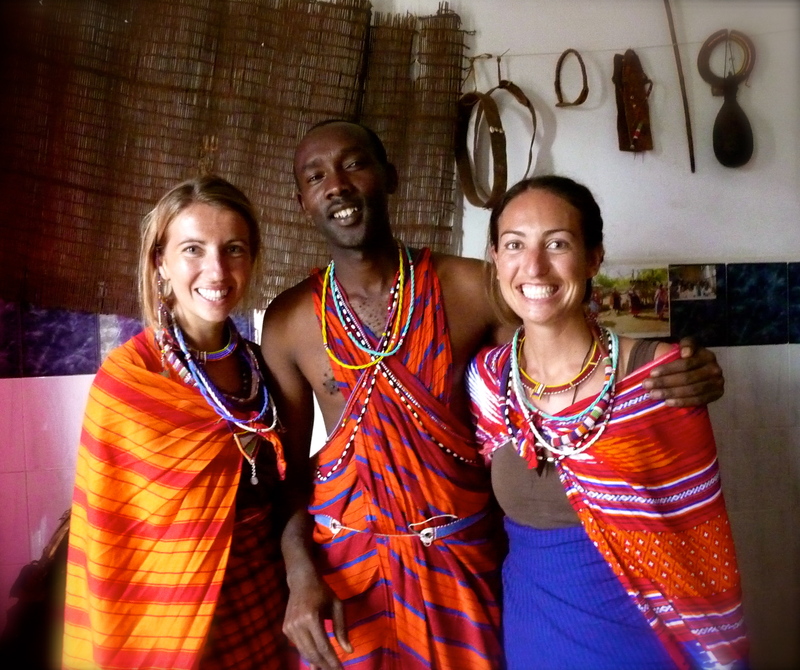 Cherie and I were confused until we worked out what was going on – they knew (magically, they’re Maasai!) that there were zebras in the bush up ahead and they wanted to show us. They split up and helped to round up the zebras while we ran as quickly and quietly as we could through the bush, getting constantly snagged on thorns and low-lying branches. Eventually we broke into a clearing and there were zebras, beautiful with their almost unnaturally perfect stripes, standing before us. It’s one thing to see such animals on safari, another to see them face-to-face walking in the bush. We had heard many stories during our time there about it being unsafe for the children to walk to school due to wild elephants and there had been many fatal run-ins with people and tusks. I tried to push that from my mind. Just enjoy the zebras. Everyday was a new adventure. Mayeni returned the next day to take us to visit the school that Pillars for Maasai Development had set up. Little did I know quite how far people here walked to go to school. In the hot, dry heat, walking through red dusty earth I felt as though I was going to pass out but it was all put into perspective when I was passed by an elderly women carrying a giant jerry can of water on her back, oblivious to the scorching sun overhead. People here learn to make do; complaining is not a way of life. So I kept on walking. After what felt like years, a building appeared on the horizon. It was not hard to spot – there was nothing else around for miles. But this was the central point for Maasai children of the area to come and study. At the moment there are only two classes in two classrooms but it is a start and they hope to grow and continue to spread education through the Maasai community. It is admirable work and the people involved are passionate and dedicated despite limited resources and adverse conditions – the rains have not fallen now for over a year and the community is desperate, but when the rains do come, the rivers flow wildly and the children cannot cross them to get to school. Never mind the wild elephants. I never thought getting to school could be such a challenge. From there we walked to the compound of the school chairman. 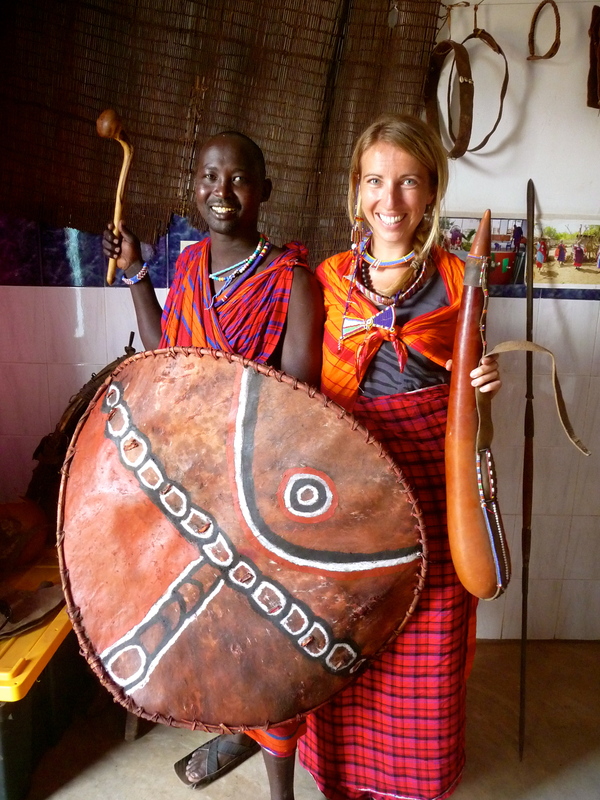 We arrived to a massive welcome – men and women had come from far and wide to greet us and they sang as we entered the compound and danced in the Maasai way, i.e. jumping up and down towards you. I wasn’t quite sure whether they were meant to jump into us or we were to step back. I stepped back. We sat in the coolness of a large mud and thatch hut and chatted as best we could despite the language barrier. One of the elder women, also named Grace, was wearing the most beautiful jewellery and as Cherie and I admired it, she took it off and offered it to us. I insisted on giving her some money and now am the proud owner of a spectacularly coloured Maasai necklace from the neck of a Maasai elder. Some things in life you will cherish forever. Despite the famine and drought, we were served a feast fit for queens (Tumaina constantly calls us ‘his queens’) and again blown away by such hospitality for us, total strangers, come to peer into their world for a few short days. Our time flew so fast and all of a sudden five days were over, filled to the brim with amazing memories, fascinating stories, mind-blowing conversations and spectacular views. And now I feel like I have yet another new home, here in the middle of nowhere, where people have nothing by Western standards but for them they have everything they could dream of and more. Except rain. We told them we would wish for rain and they clapped and cheered in gratitude. Tumaina escorted us to Nairobi which was hilarious on so many levels – we had been a little worried about going to this city with such a dangerous reputation but now we had a Maasai warrior watching over us. I couldn’t help but laugh at this bush man in the city, trying to tell Cherie and I how to cross the road. I don’t think he believed we could manage on our own so he held our hands. Literally. We spent the day walking hand in hand with a tall, handsome, branded Maasai through the streets of Nairobi getting all kinds of crazy looks. Tumaina loved it and said these people will be wondering how a Maasai like him found muzungu wives like us. I didn’t know whether to find it strange or funny or both. I went with both. We farewelled our new-found Maasai family with hopes and promises to return some day and caught many a bus across Kenya to finally arrive back here – in Kampala. It felt so good to cross the border back to Uganda and in a strange way, it felt like we were coming home. Here things are familiar in an unfamiliar way – at least I know what madness to expect here! As if it wasn’t enough to try and process our Ugandan homecoming, I received an unexpected message from John, an old friend from Wellington saying he was in Kampala if I was around?! I would have fallen off my bus seat had I not been wedged in with 22 people and a baby and we literally had a kitchen sink on the roof. We caught up with John in Kampala and learned he has moved here to do his masters in Peace and Conflict Studies at Makarere University. I’m so happy to have him here; it will be amazing to have a familiar face in Kampala and another friend to share this wild and wonderful world with. Tomorrow we go back to the village, trading Maasai warriors and thorny bushes for our world of banana palms, Ugandan children and our giant KAASO family. It has been six weeks on the road and I am looking forward to seeing everyone again. There’s always a tinge of guilt telling stories to people you know will probably never see half the places you have travelled within their own continent but everyone is so curious and interested to learn that I know the stories will be told. The dormitory construction is in the final stages and I can’t wait to see it with my own eyes. We have heard so much about it from Dominic, it will be amazing to walk through a door onto a concrete floor where before weeds grew wild amongst the bricks. So I will spend my last night in the city at our favourite guest house, overlooking the lights of Kampala, making the most of electric light and running water before we return to our village home away from home. Life in all its contrasts, it really is an incredible world.